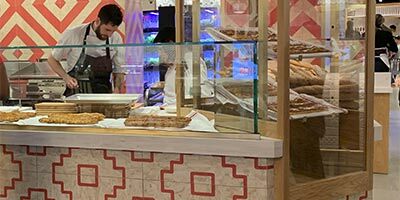 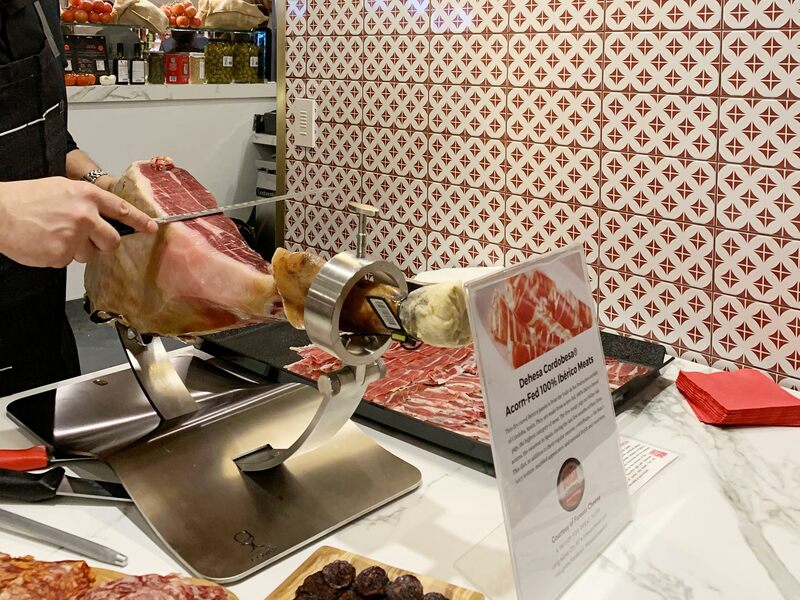 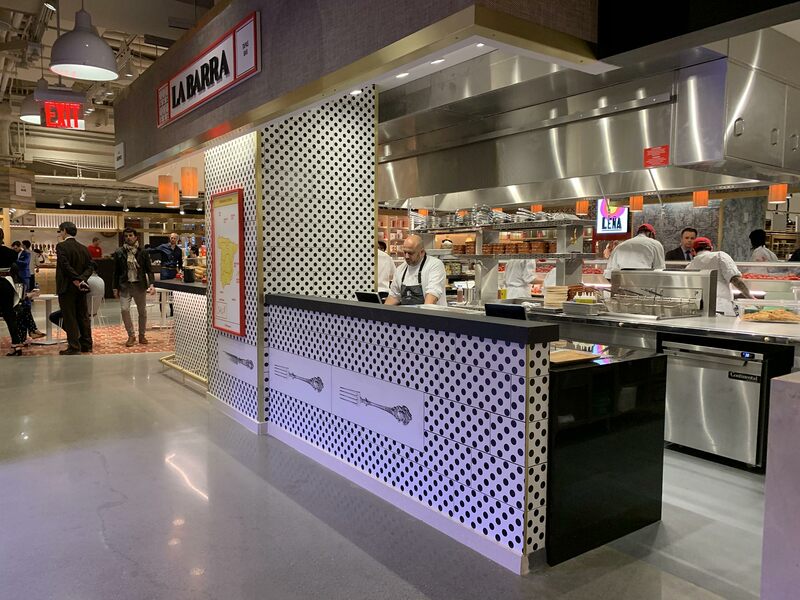 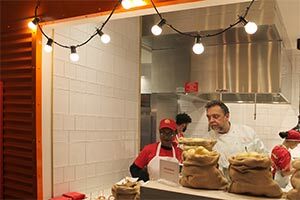 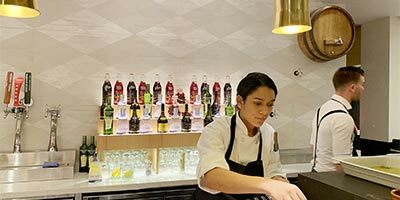 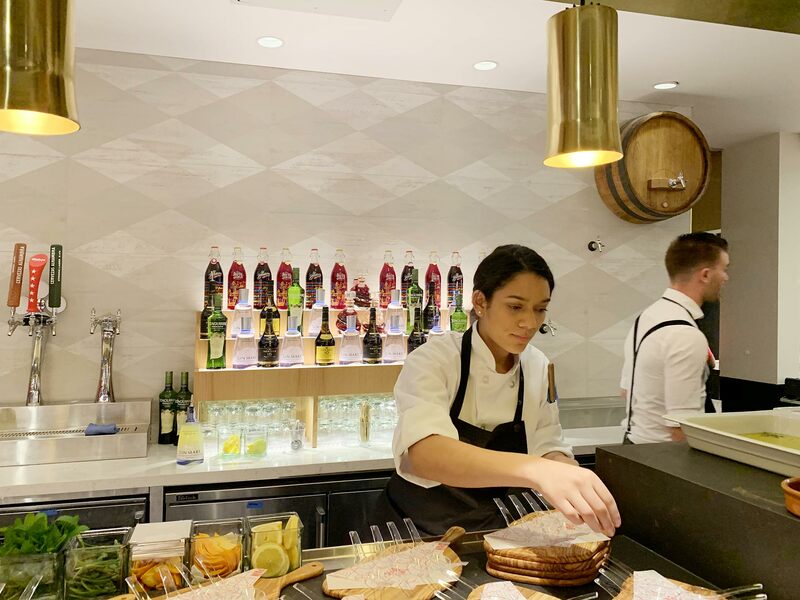 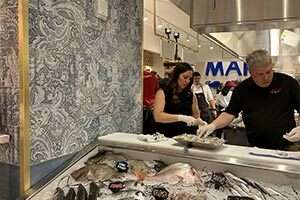 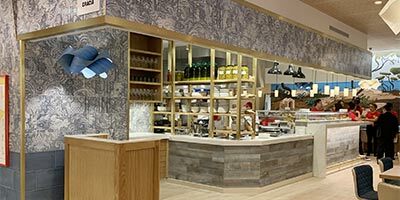 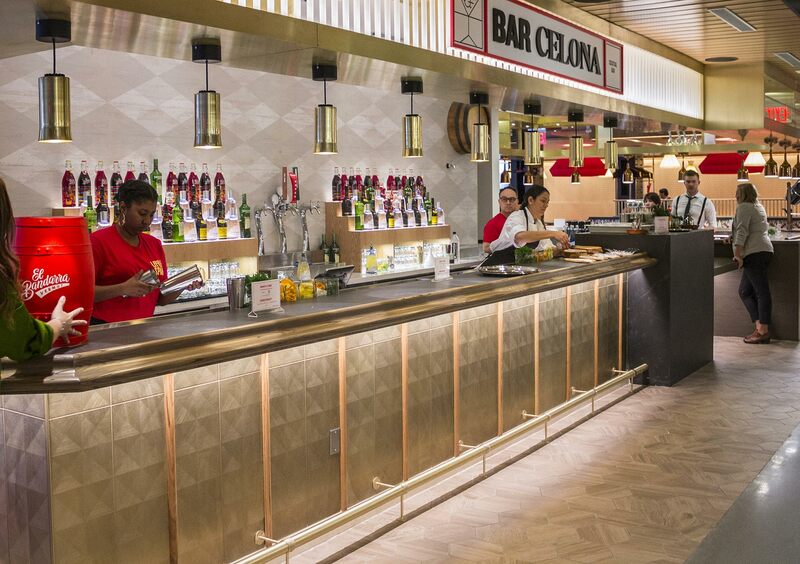 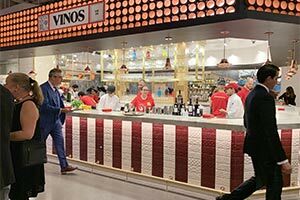 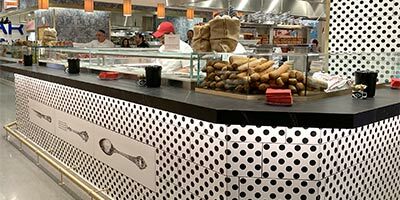 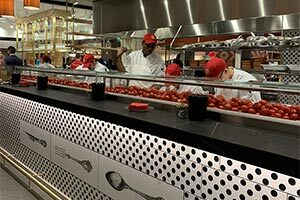 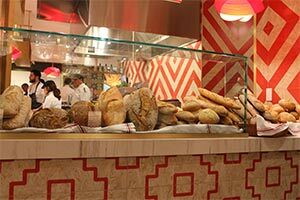 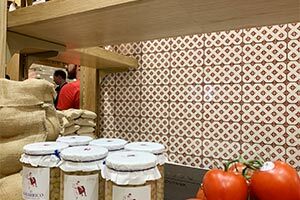 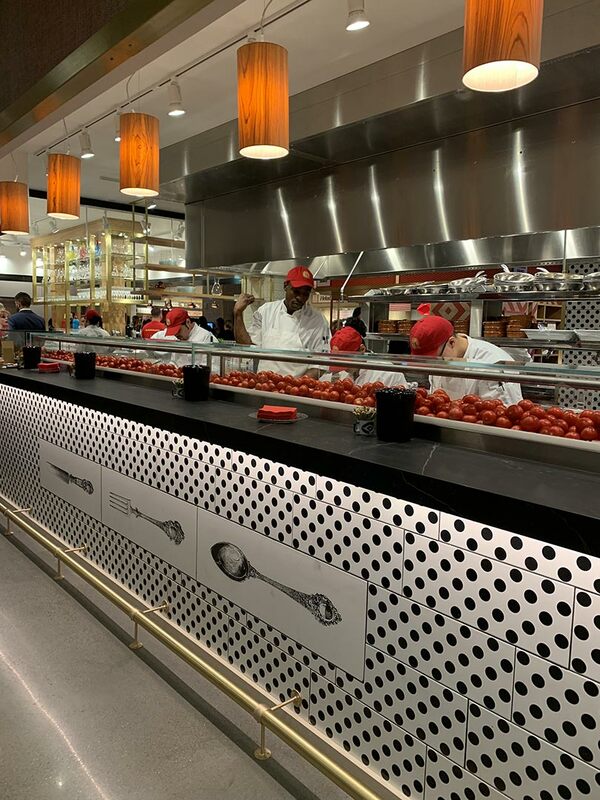 Located in the new district of New York, Hudson Yards, the Spanish chef José Andrés, together with the Adrià Brothers have launched the Little Spain project. 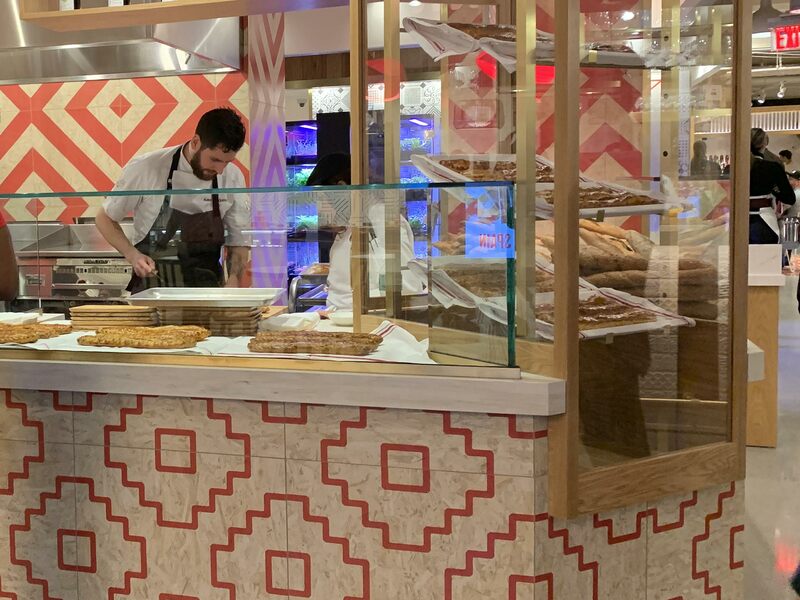 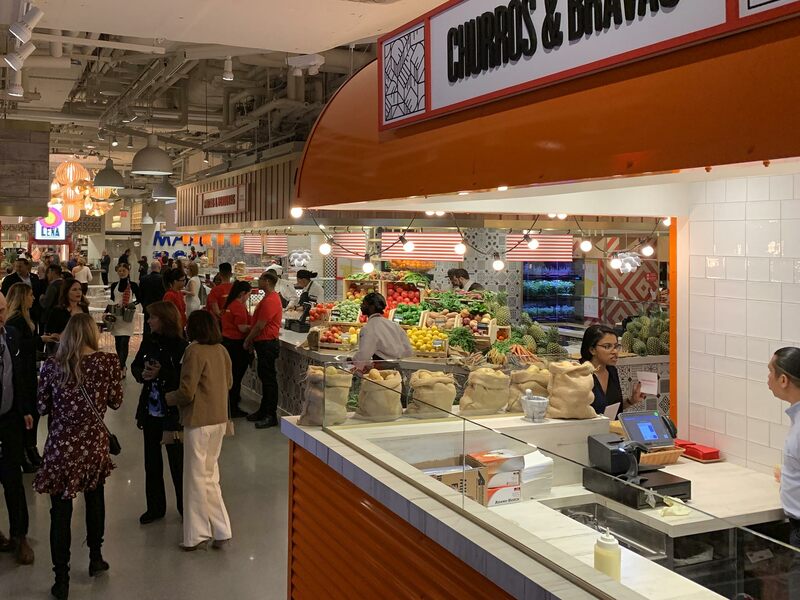 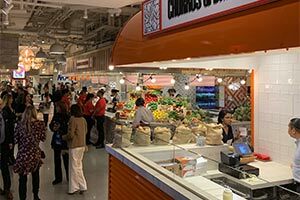 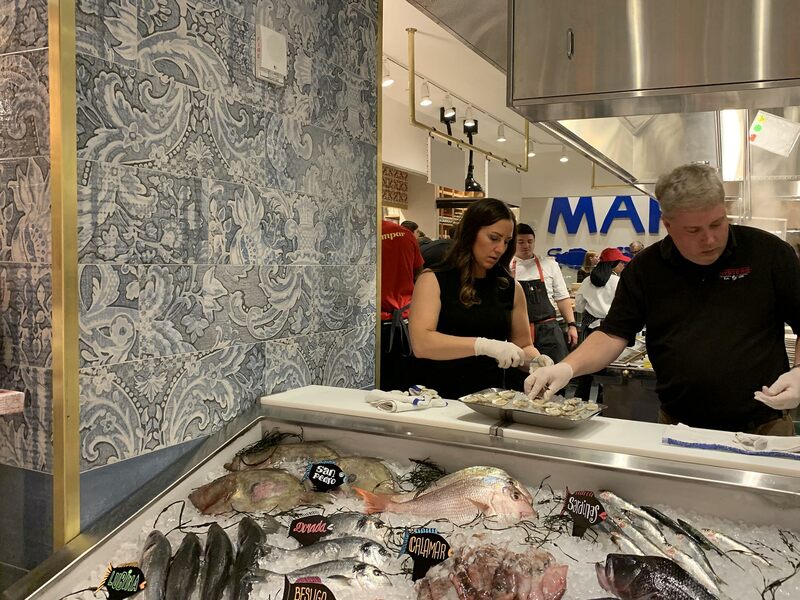 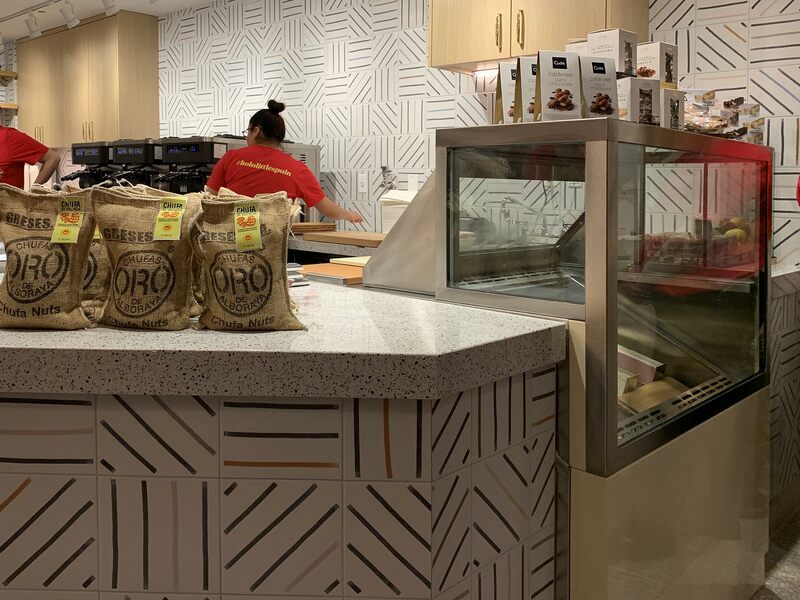 A modern and avant-garde gastro version of the traditional Spanish market, which aims to pay homage to the culture and cuisine of our country in Manhattan. 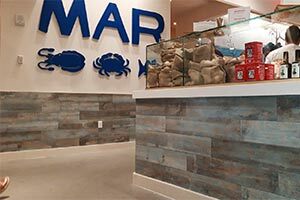 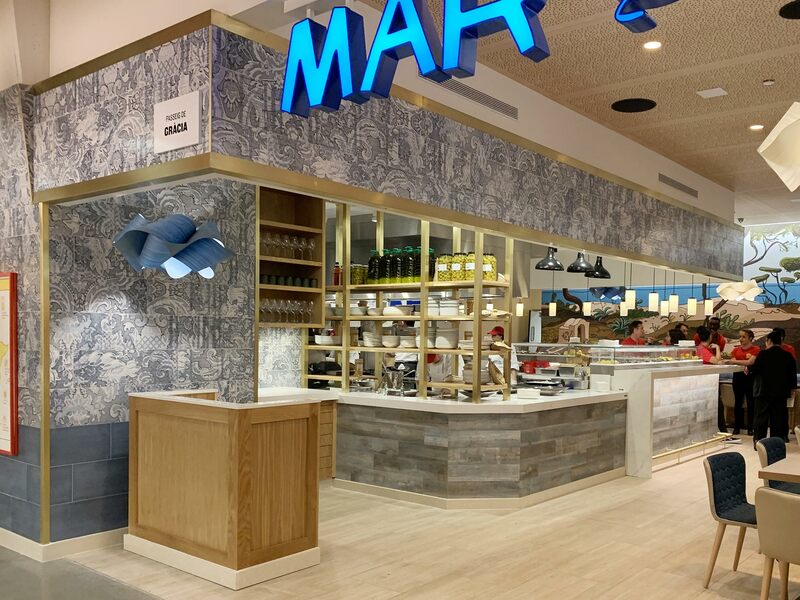 The Mar restaurant plays with different designs with blue tones to create an environment full of freshness. 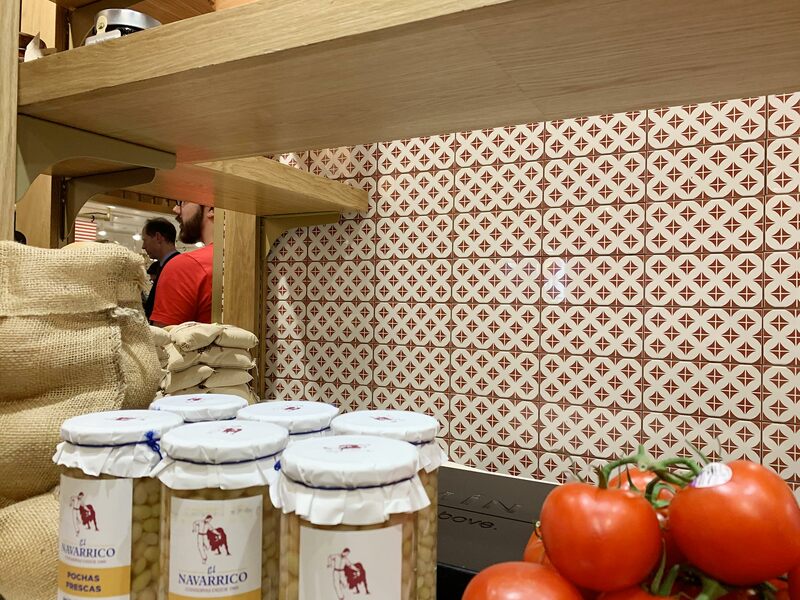 The Yugo Cielo vintage porcelain tile wood combined with the Laterza Azul and Nevers Azul (25x75 cm) wall tiles make up the work area, while the wood look Orsa Avellana porcelain tiles cover the dining area. 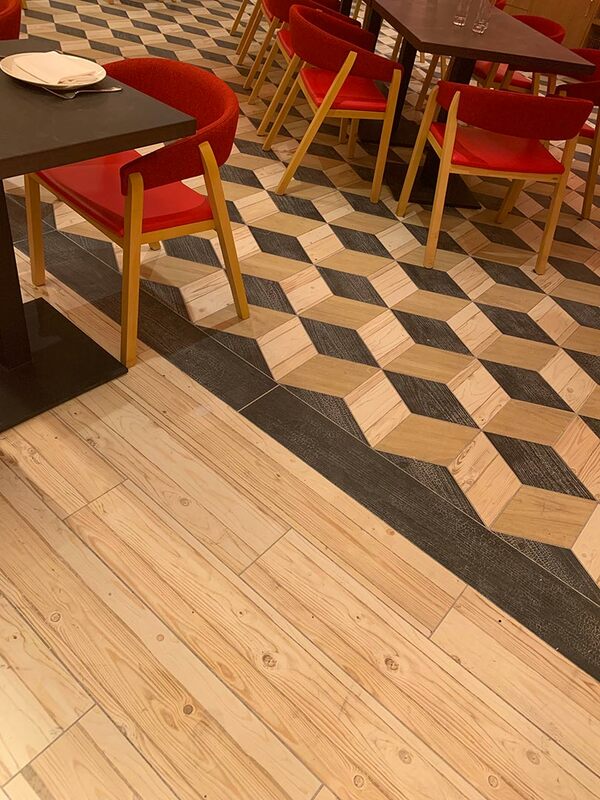 The Leña Restaurant is designed with the World Woods porcelain tile series, combining the rhombus format and the 19.2X119.3 cm creating an original ceramic pattern in the central space. 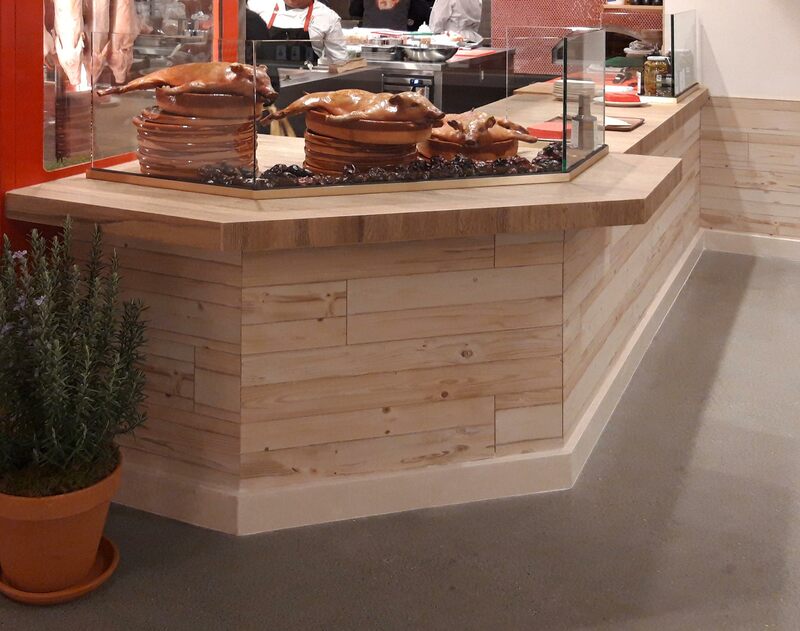 For the kitchen, the Morthier Natural 10x20 cm beveled design and the Fremont ceramic wood were selected. 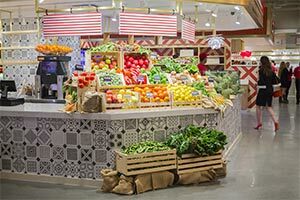 Another of the central areas of the Little Spain Market is the Spanish Diner. 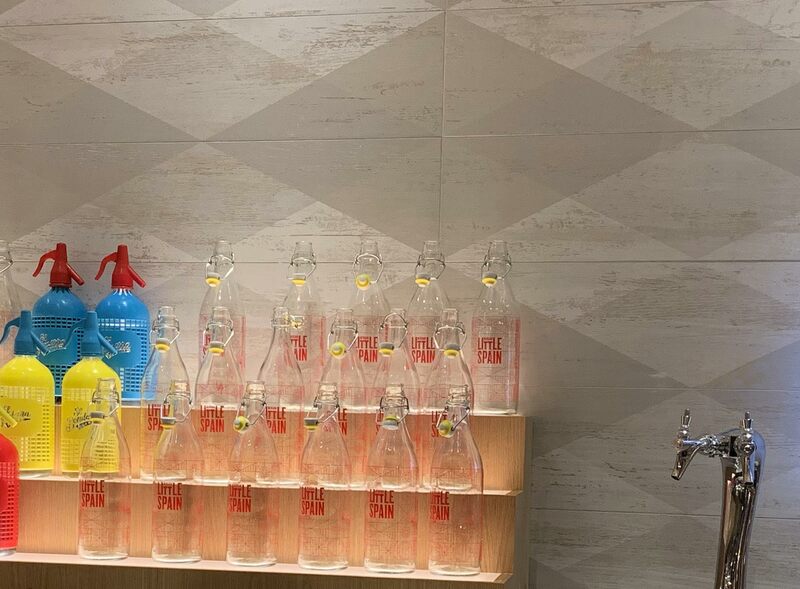 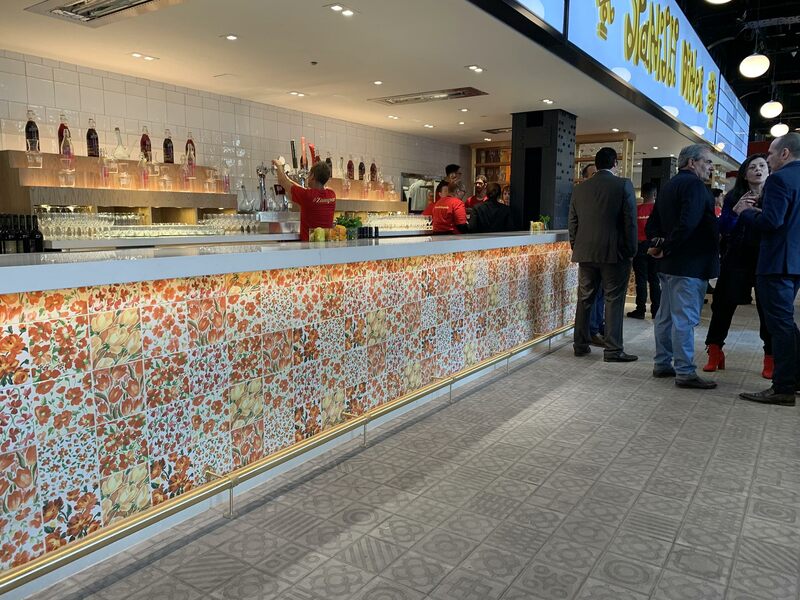 It combines the World Streets porcelain tile series on the floor, with the floral patchwork appropriately called Patchwork-12 on the main bar, a cheerful and colorful wall tile that perfectly represents the Spanish style. 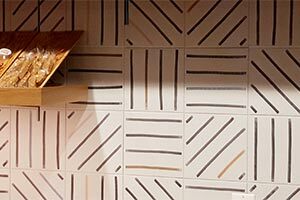 In this same space the Etnia Blanco wall tiles have also been included combining the different formats (10x20 cm, 13x13 cm, and 20x20 cm). 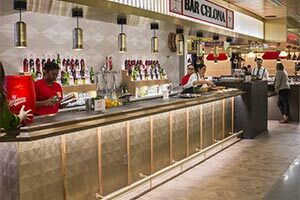 The Bar Celona Cocktail bar displays a highly original combination of VIVES ceramic woods, generating a sophisticated and calming space at the same time. 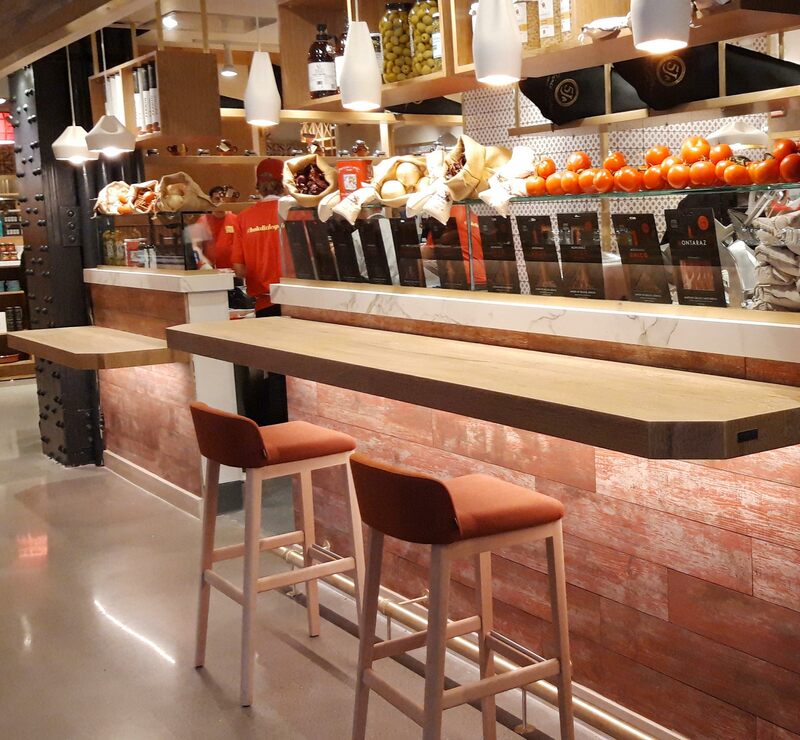 The Gamma Miel ceramic wood stands out on the floor and is combined with the Milford Oro wall tiles from the Halsa series, and the Dion Blanco porcelain tiles, from the Efeso porcelain tile series. 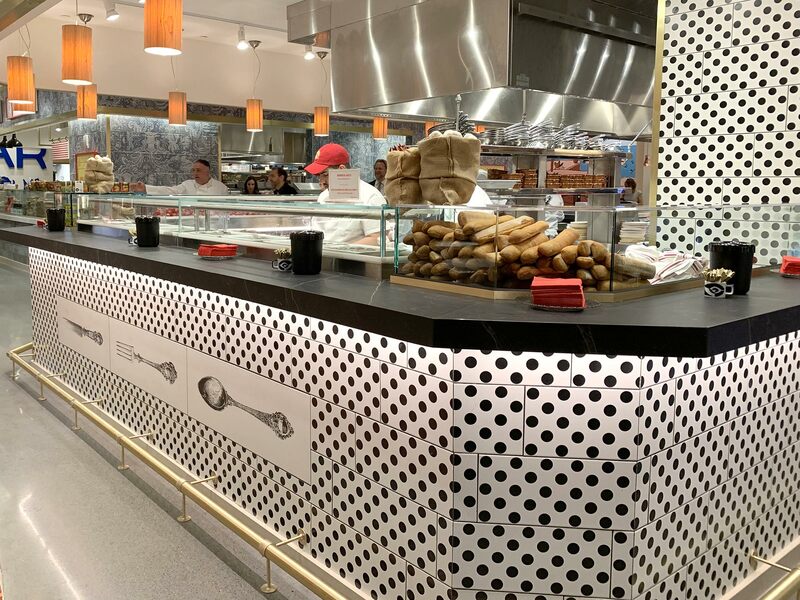 Black and white takes over La Barra with the Rimini wall tiles 20x50 cm in dotted pattern and Manger in the size of 32x99 cm. 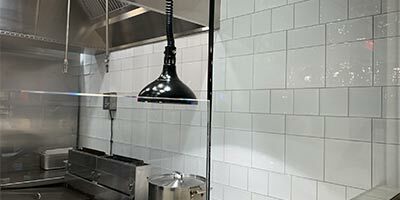 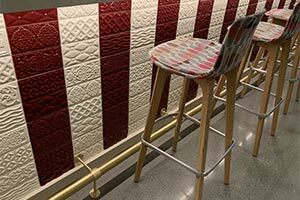 The final touch is added by the Raspail Blanco wall tile covering the columns. 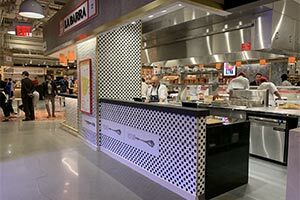 A daring stage with great personality for the tapas area. 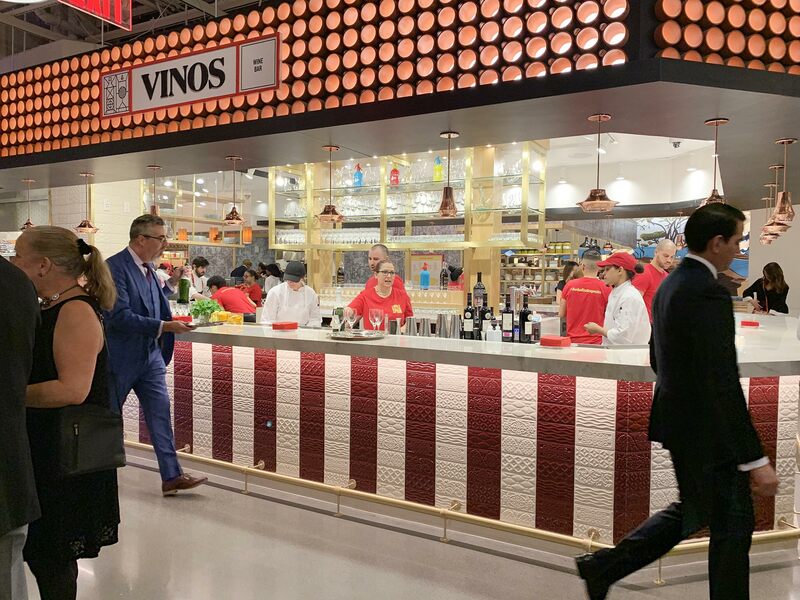 The Spanish wine could not be missed out in this culinary project. 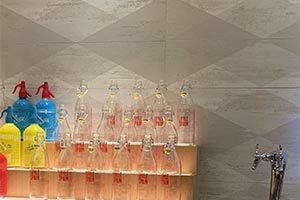 For such an outstanding area, the Rivoli wall tile series and the Raspail Blanco and Raspail Cereza models (10x20 cm) were chosen. 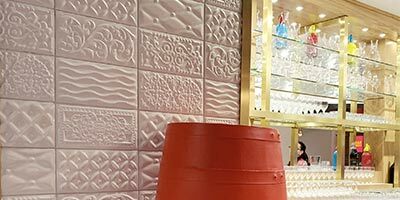 Its intricate designs in different reliefs are a commitment to traditional beauty from a modern perspective. 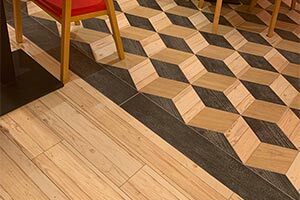 The Strand series and its OSB aesthetic also occupy a privileged area within the project. 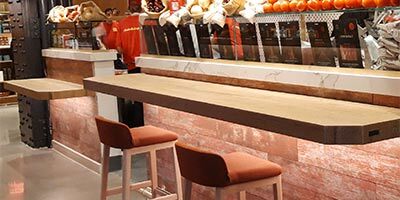 Combining the different designs of Seriaki-R Natural Rojo and Nenets-R Natural Rojo, you get a striking and urban result at the same time, in tune with the city that never sleeps. 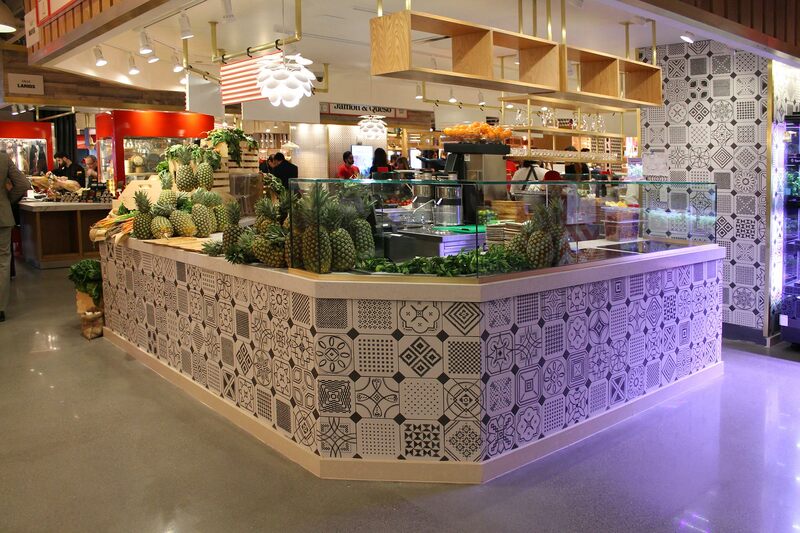 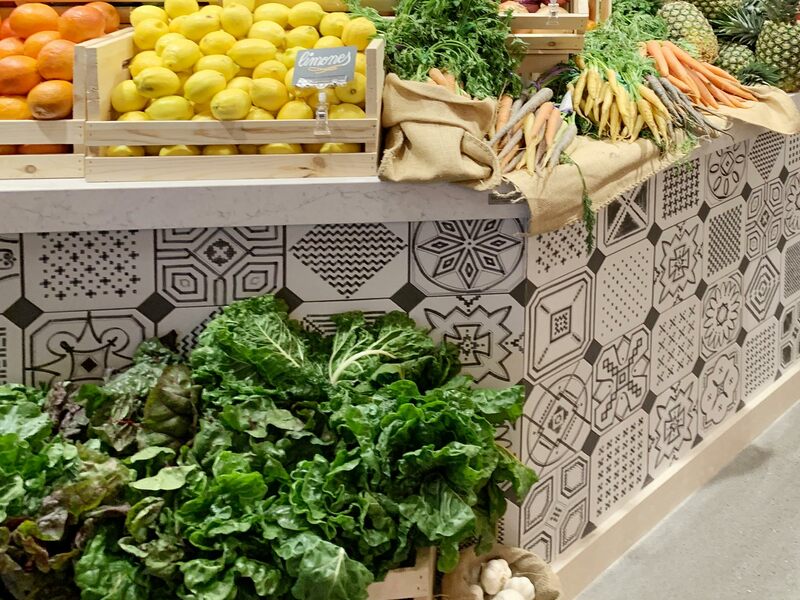 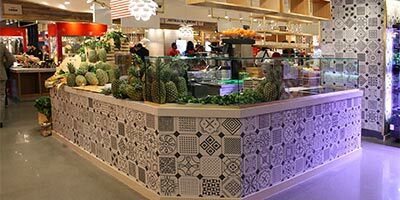 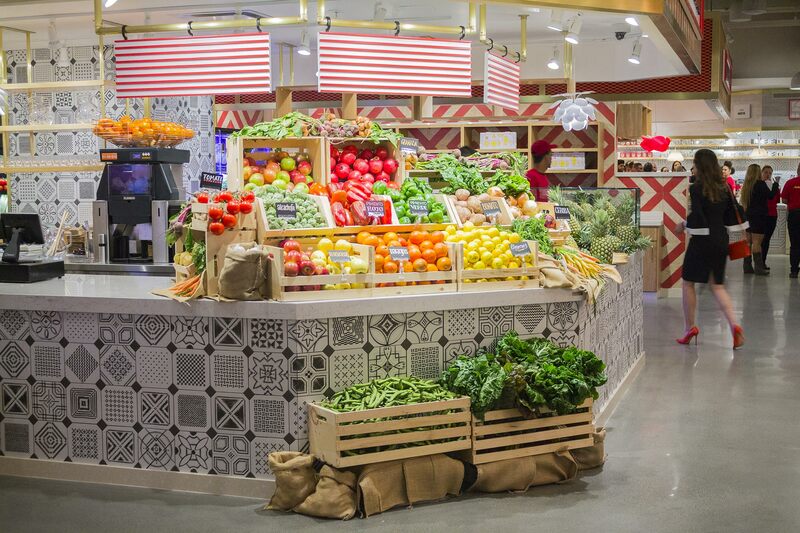 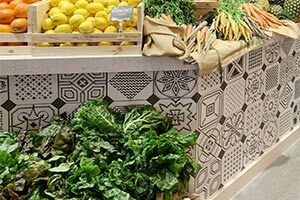 One of the most recognizable designs of Vives covers the Fruits & Vegetables space. 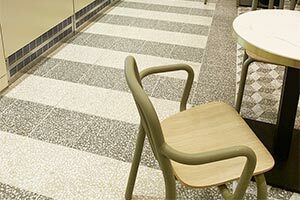 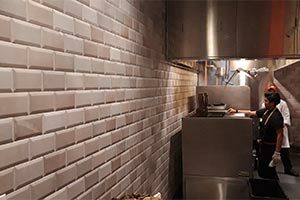 It is the Variette Sombra 20x20 cm porcelain tile from the Vodevil series, which, with its black and white lines, immediately attracts attention both in the bar and in the work area. 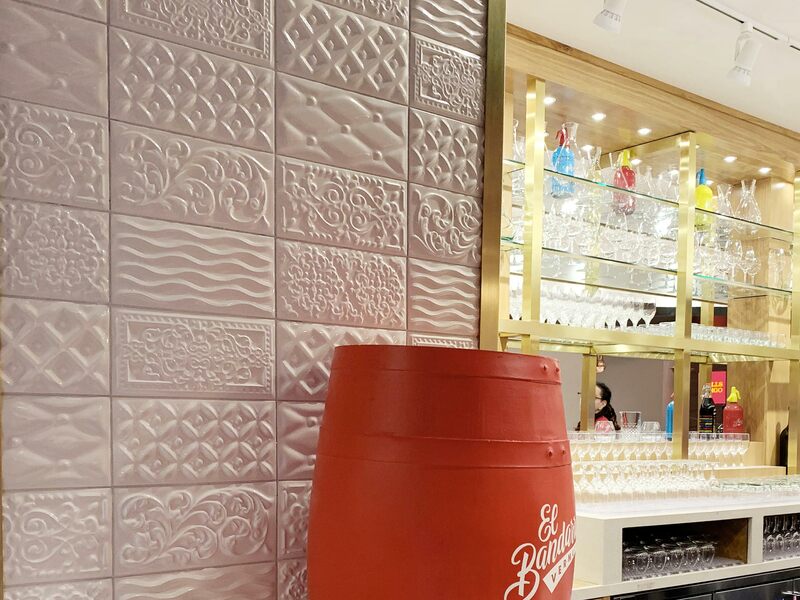 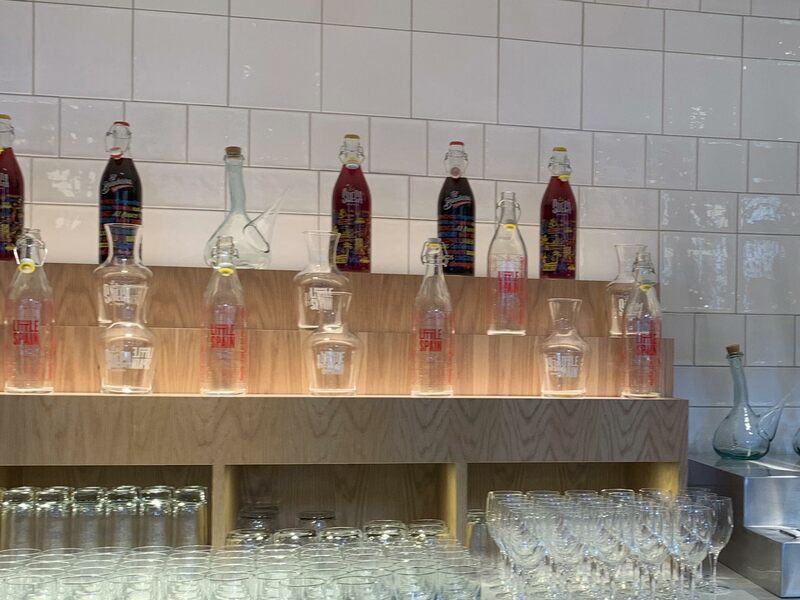 The small 10x20 cm format of the Tasty Cherry wall tile adorns the inner part of this space, while in the bar we find the Yugo Volcán – a wooden vintage-style porcelain tile. 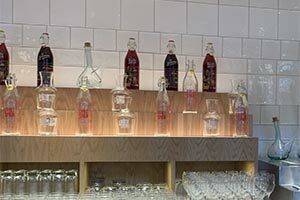 The energy of the reddish tones is transmitted to the environment. 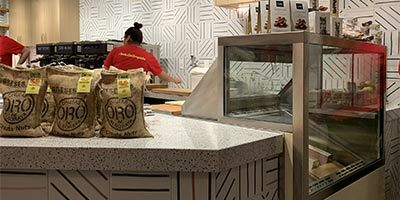 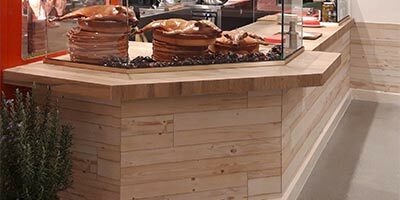 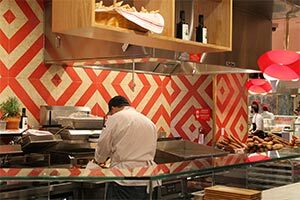 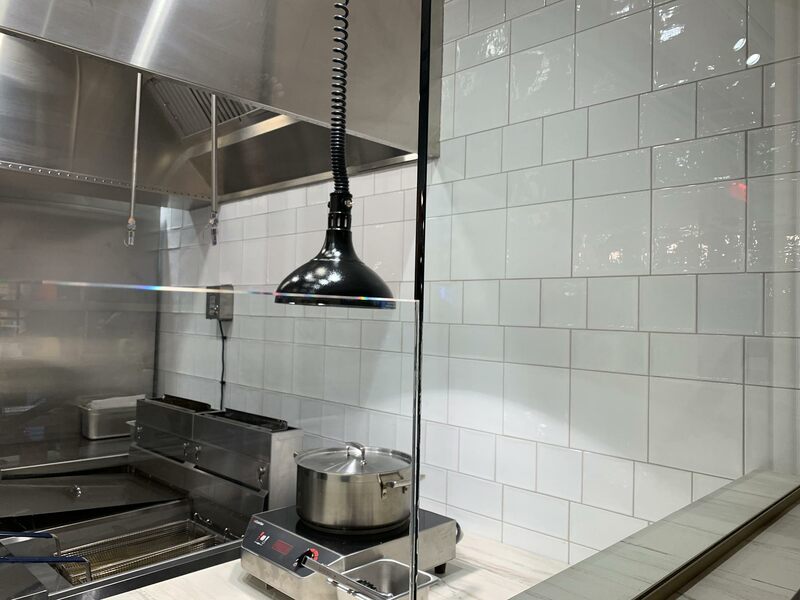 With a design that emulates the original foodtrucks, this section of Little Spain has the Etnia Blanco wall tile in different formats (10x20 cm, 13x13 cm, and 20x20 cm) in contrast to the red metal that covers its exterior surfaces. 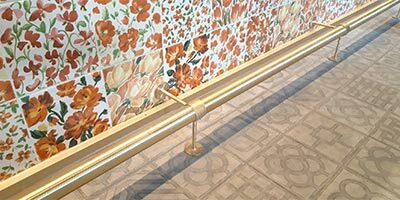 We keep the sweetest corner of this project for the ending. 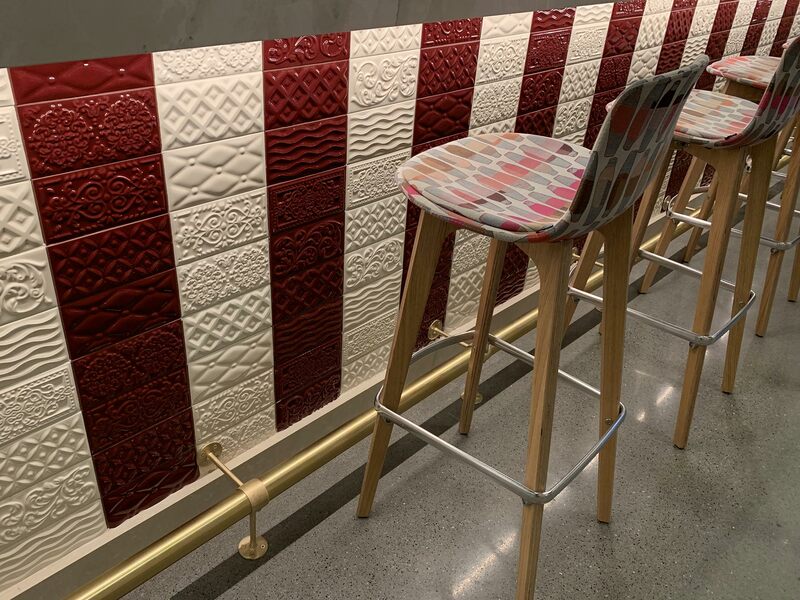 Standing out for its clear tones and luminosity, this space features the Efeso Blanco porcelain tile combined with the Tielebe porcelain tile from the Maori series, which features within the bar area and the back walls with its “marker” stamp. 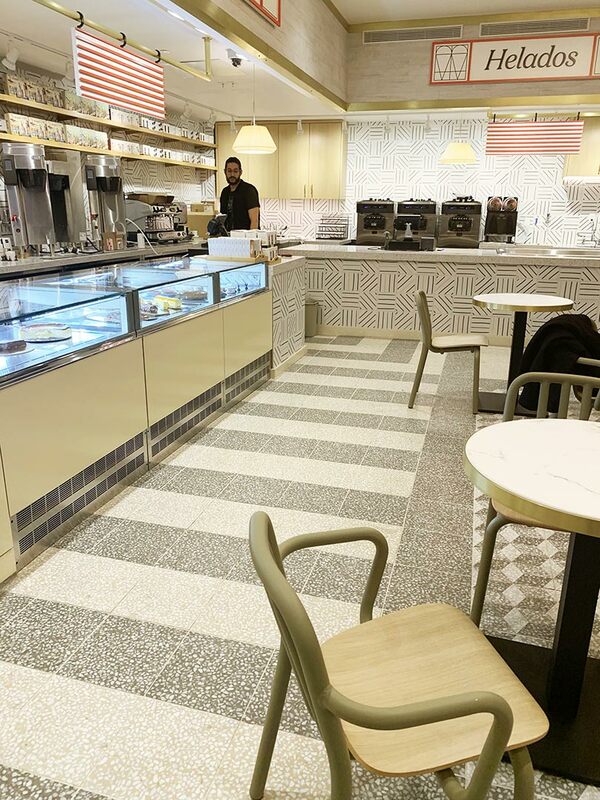 On the floor, the Amalfi Beige, Amalfi Grafito and Cavour Cemento porcelain tiles combine to create original symmetrical designs separating the different areas. 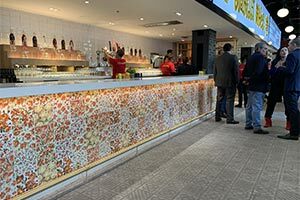 The graphic designer Mariscal, the muralist Sergio Mora and the studio Lo Siento have also collaborated in the project.